The American Health Care Act (AHCA), currently being considered in Congress, would dismantle key elements of the Affordable Care Act (ACA) and would fundamentally change the way the federal government funds Medicaid by capping federal contributions. Among other changes, the bill would dramatically reduce federal funding for the ACA’s largest health insurance expansion: the extension of Medicaid (called Medi-Cal in this state) eligibility to all low-income adults. 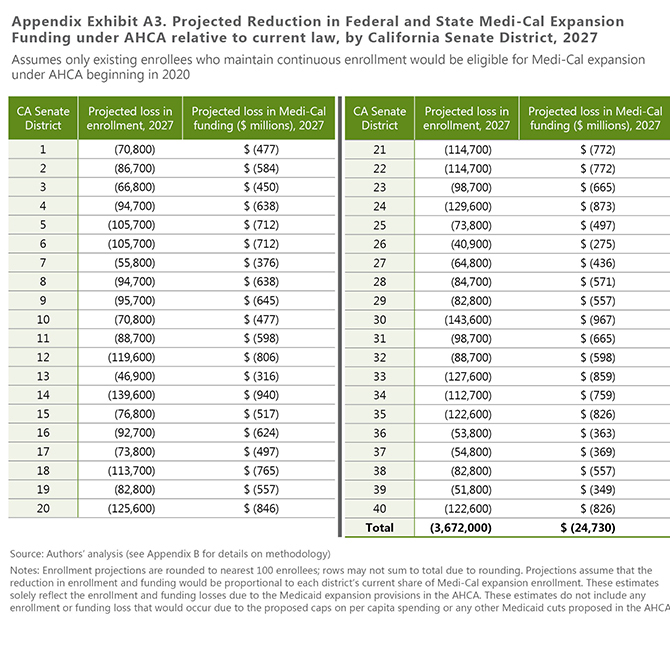 In this brief, we project the impact that the proposed cuts for the Medicaid expansion eligibility group under the AHCA would have on Medi-Cal enrollment, the state’s budget, and the Medi-Cal funding that supports the state’s healthcare system, over a ten-year period. 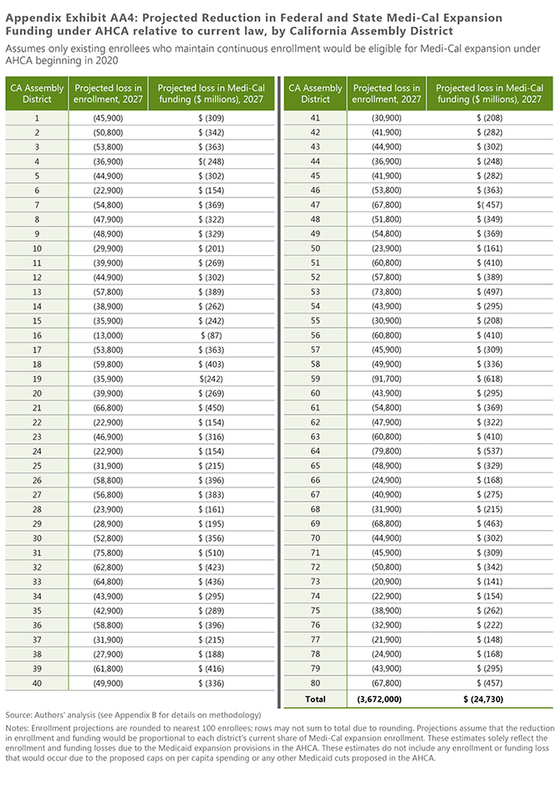 California would have to increase state General Fund spending by nearly $10 billion annually by 2027 in order to keep the ACA Medi-Cal expansion open to new enrollees. This is because the AHCA would cut federal funding for new enrollees in California by 40 percentage points beginning in 2020 and the state would receive this lower federal match for a growing share of enrollees each year. The state’s healthcare system would lose a cumulative total of $130 billion in federal and state Medi-Cal funding between 2020 and 2027. Certain parts of the state would be especially harmed if California is not able to fully maintain the Medi-Cal expansion due to the federal cuts. For example, in the San Joaquin Valley, where residents have a high rate of enrollment in the Medi-Cal expansion, over 465,000 residents would be projected to lose Medi-Cal coverage in 2027 and the local healthcare system would lose more than $3 billion in Medi-Cal funding annually by 2027 if the state closes the expansion to new enrollees due to the federal cuts. Other more rural parts of California would also face serious losses, as would Los Angeles. Projections by county, Congressional District, California Senate District, and Assembly District are included in Appendix A of this brief. 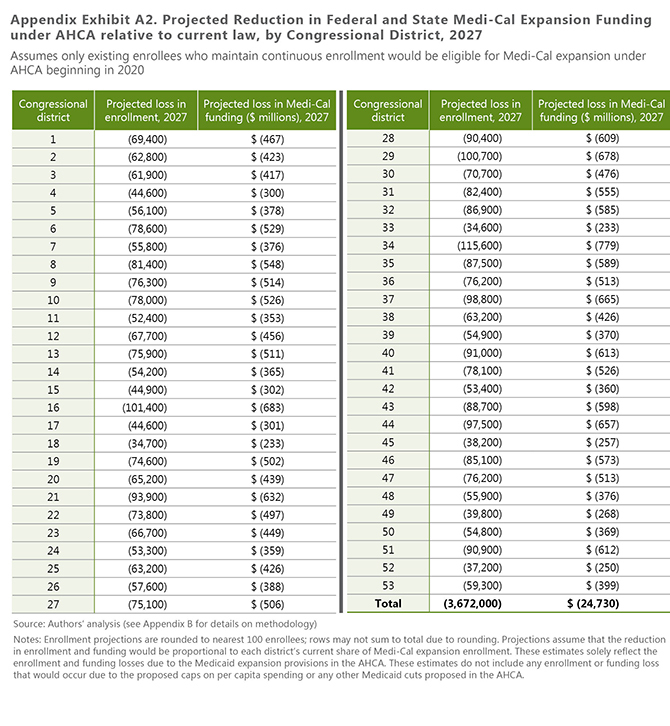 California’s potential coverage and funding losses due to the AHCA would extend beyond the estimates in this brief because of other provisions in the bill such as capping federal spending per enrollee, but the impacts of the Medicaid expansion provisions in the AHCA are the focus of this brief.